As Dharmaists we find meaning not in Islamism. Where though? Practice? The results of practice? Happiness? The three jewels? Personally I find service and kindness a useful Bodhisattva type direction. However my fish stocks and imaginary cupboard full of Buddhas might not agree. What is your meaning? Being reasonably well? Content? Open to answers? If you give meaning to your life, then life will also have a meaning. -be open minded and not judgmental to people on a diffrent path. -make good and healthy food. -take care of people around you, help them when you can.
" Waking Up Waking up this morning, I smile. Twenty-four brand new hours are before me. I vow to live fully in each moment and to look at beings with eyes of compassion". Simple. The meaning of life is to conceive abstract notions, like meaning, about concrete realities, like life, or abstract notions, like meaning and life, about concrete realities, like meaning and life, and to connect those notions to form more complex ones that can be formulated into questions with answers to pursue. Jellyfish can’t do that. At least, I don’t think they can. Maybe it’s not doing that. That’s the meaning. Or both. I’m pretty sure it’s one of those three things. I’ll have to get back to you on this. Meanwhile, it occurred to me this morning that if I would discern states connected to desire, hate and delusion or their opposites in myself and respond to those states with an appropriately sublime attitude, then shouldn’t I discern and respond the same with others? Personally I find service and kindness a useful Bodhisattva type direction. I never asked about the meaning of life. When I started practicing, thats when I found I need an intention or goal to practice (is it "in the moment"; nibanna; service to others; etc). What is suffering? I never knew it was a internal issue until I started practicing. Helping others didnt have a priority meaning as I couldnt identify that without thinking of a purpose Or some purposes at least. In the moment purpose is taken to where living in the past has no value and future doesnt either. I feel its a balance of sorts. I added up things that bothered me tremendously such as killing, genecide, limiting ones freedom, lack of communication, and lack of respect and inequality. I broke these up under the precepts on different ways one can kill, steal, act inappriopriate around others, and obsorbing things unhealthy for the mind. Any form of intoxicants. Once I broke up my issue with no killing, now my purpose is the opposite. Save lives. I can do this in many ways. The Dharma helps put perspective on how for our own liberation and others. I've always had a hard time wrapping my head around this question for some reason. I think life has always just been life to me, I'm part of the slacker generation and tend to fit the mold. All I've ever really wanted is to be happy and I never really sought any purpose beyond that. So now having some knowledge about philosophy and all that I'm either an existentialist or an optimistic nihilist when it comes to meaning. Meaning I don't really look to the universe to offer my life meaning, I think it is up to us to give our life meaning. It's interesting to see this pop up. Every day, my husband asks what I did. I usually answer with "I did laundry, not much else." And every evening I would be disappointed (not quite, but that's the best word I have) with looking back on my day. I'd wake up and think "Sigh, another day of the same routine." And go to bed with "Sigh. Another day I didn't do much of anything." It didn't feel that way as I went through my day, but trying to evaluate it, I felt like I didn't "accomplish" much. So yesterday I decided I would photo-document my day and tried to keep it as average as I could. I took about 40 pictures during my 18 hours awake and it was honestly quite fascinating. Our lives are more interesting than we give them credit for. Weaved into the routine and same-ness are a million moments of not-same. For me, that is where life is. Can I assign some phrase or something that defines what life means? I can't really. I've never been able to. I can feel it, but every attempt to describe it falls short. But it reminds me of those gaps you get in awareness when you find yourself in that spaciousness of mindfulness/awareness. I shared it on FB, and a friend commented how interesting my life is. It's really not. It's just a life. I told her to try it, and see how many amazing moments she finds in a day that aren't about drudgery. Just like awareness, life happens in the gaps, in the moments. It's too simplified and cliched to say "it's all about the little things" because they aren't little things. "In Buddhism, the primary purpose of life is to end suffering. The Buddha taught that humans suffer because we continually strive after things that do not give lasting happiness. We desperately try to hold on to things - friends, health, material things - that do not last, and this causes sorrow". 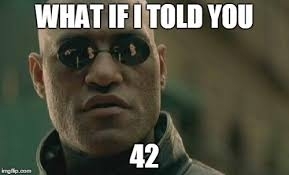 Rumor has it the answer to the meaning of life is 42! However, Viktor Frankl states that it is we who give life meaning, and the more we behave in a compassionate, altruistic and generous loving way, the greater meaning we give it. I use to run Feng Shui courses, incorporating Space Clearing and the Bagua. One of the greatest compliments I ever received from someone attending is that I #made a difference'. It's never been far from my Conscious, that how we behave towards other people, always, but always has an impact. It's up to us to ensure that impact is positive, rather than negative. Live, laugh, love, eat, pray...all that sorta stuff! Oh, forgot sing. In a life that seems to make no sense, the meaning I have found is to make peace with this life as it is, as it comes, not as I would like it to be. To stop grappling for answers and drop rhetorical questions. To work with what is. Not to miss what is not. To create a positive life for myself and for the people that make up my reality. To choose to be happy no matter what. And if I cannot be happy, to be contented and accepting: accepting of the things I cannot change. But proactively change those things that depend on me to change. My personal version of cessation of dukkha is inner peace. No, seriously, I don't know. Meaning of life: Absorb energy and disperse it with the awareness of a flowing occurrence. 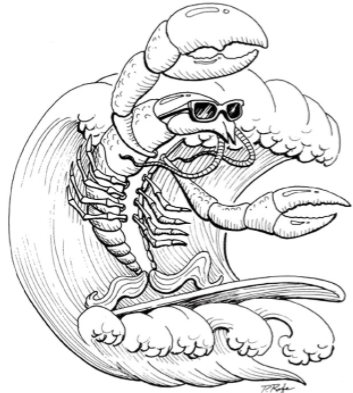 Thanks, @lobster. Great doubt, great faith, great determination. Share information, have fun and not to hurt anyone nor let ones self be hurt. Help ease suffering and take the vows as if I were a bodhisattva. Wake up as much as possible. That sounds more like a wish list. But then again, meaning isn't any less meaningful if it's something we make rather than find. 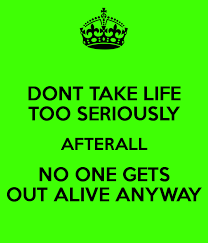 Life.....Not to be taken too seriously, other wise it will be too serious..
Maybe we don't have to. Maybe there is none BUT chaos and nihilism is so ... empty and meaningless. The three jewels 💎™️ and other Buddha developed technology may help. That's the dharma plan. To learn to cope with all the junk that the mind generates, and return to the ground of being underneath. To be joyful in just breathing. To be in the moment. the meaning of life? what has helped me to live a life of faith , hope ,and love is the statement--love solves,love saves,love wins.just a personal believe keeps me going.so i live.simplify this life--work , masterbate,eat,sleep...the mudain stuff. ...this also lead me to the thought --which has subtle difference--what is the purpose of life? my answer was--to love. .......in a chatty mood.to love,in a buddhist perspective , to metta you.thus the buddha,thus came and thus gone--definition of the tathagata--left metta footprint.they also say about the buddha,he who loves most,loves best. It is almost like we are the witness to creation or through us the purpose/revelation is unfolded. That would perhaps be a very theistic/mystic understanding. The meaning of life is different for every individual although there are some things that apply to everyone. We want to experience and do things actively. So as mentioned already it's a good idea not to spend too much time watching tv and such. The other thing that is important is to be aware of what is around you and open yourself up to the possibilities. ...and always be prepared for the unexpected. And that's a good point, what's happens next can be very unpredictable. And that can be exciting in one sense. "Life is like a shopping trolley; we go partly where we want to, and partly where the damned thing takes us..."